As you grow older, age-related stiffness and discomfort in the joints becomes a fact of life. Activities once routine become a challenge as limited mobility hampers your every move. You now have a more potent option to provide broad-spectrum support for aging joints. ArthroMax? Advanced with UC-II? and Apr?s?Flex? is a formula based on the very latest data on natural support for joint health. The new ArthroMax? formula provides more joint support than ever before, enhanced with two innovative, clinically validated ingredients : Apr?sFlex? and UC-II?. Apr?sFlex? represents a quantum leap forward in the delivery to aging joints of boswellia, long prized for its ability to help with inflammatory issues. It is a superior inhibitor of the enzyme 5-lipoxygenase or 5-LOX. 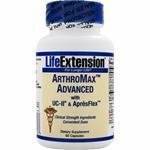 Excess activity of 5-LOX results in the accumulation of leukotriene B4, a pro-inflammatory compound that affects aging joints. Boswellia has been shown to bind directly to the 5-LOX enzyme in our bodies, preventing it from facilitating production of pro-inflammatory leukotrienes. Apr?sFlex? boswellia absorbs into the blood 52% better than previously available forms of boswellia, for superior effectiveness. In addition to Apr?sFlex? the new ArthroMax? contains a novel extract of chicken cartilage : UC-II?. New data show it helps with immune issues that can impact joint discomfort and ease of motion in aging individuals.